There was a clash on Monday between the police and members of the Islamic Movement in Nigeria (IMN) at the Federal Secretariat complex in Abuja, the Federal Capital Territory. 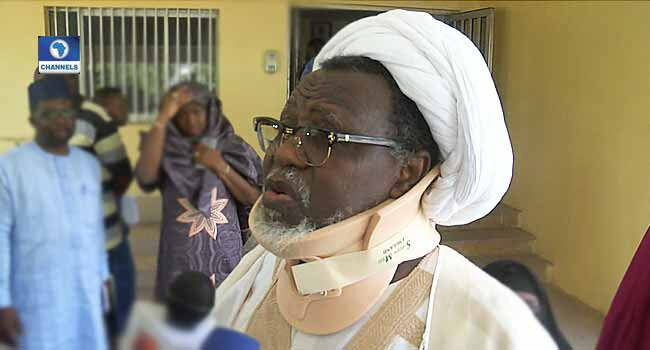 The Shiite members had stormed the area to protest the released of their leader Ibraheem El-Zakzaky, and his wife from the custody of the Department of State Services (DSS). The angry protesters were said to have grounded the complex and taken over the roads in the area, just a few metres from the Presidential Villa and the National Assembly complex. They were reportedly armed with stones, daring the security operatives that were earlier deployed in the area to dislodge them. A source, however, confirmed to Channels Television via telephone that a team of policemen swiftly arrived at the scene to disperse the protesting Shiite members. The protesters were removed from the area with tear gas and water cannon, while the Shiites also destroyed a police vehicle. 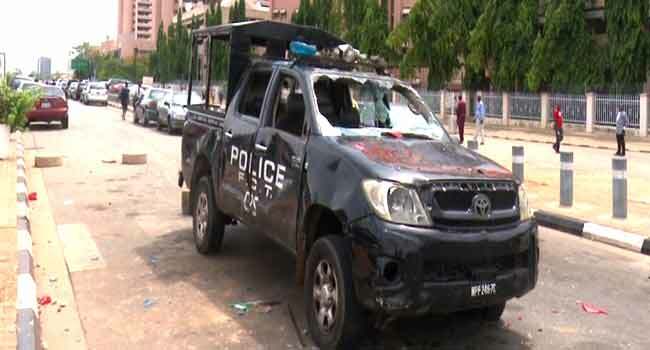 A police vehicle destroyed when the Shiite members clashed with the police on Moy 14 in Abuja. Monday’s incident is the latest in the series of clashes between both parties this year. 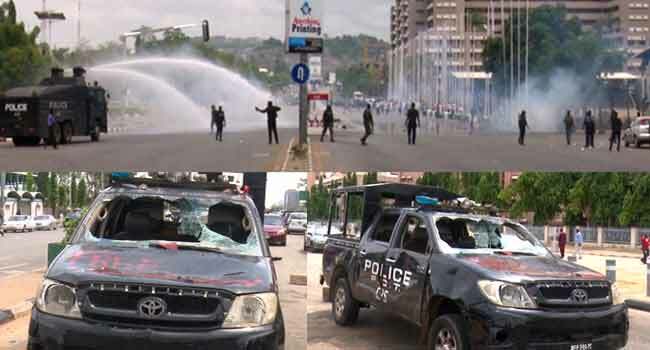 In a recent faceoff on April 23, the Shiite members threw stones and other objects at the security operatives, causing damage to cars and buildings in the Maitama area of Abuja. In return, the police fire tear gas at the protesters in order to disperse them and cordoned off part of the road between Eagle Square and Unity Fountain in Abuja. Meanwhile, the Socio-Economic Rights and Accountability Project (SERAP) has continued to accuse the Federal Government of disobeying court orders over the continued detention of El-Zakzaky. Ibrahim El-Zakzaky addresses reporters in Abuja in January 2018. In a petition dated May 11, 2018, SERAP asked the United Nations to uphold Nigeria’s international obligations on the protection of the independence and integrity of the judiciary. El-Zakzaky was detained after members of the Shiite group clashed with soldiers in Zaria in December 2015, an incident which led to the death of several people. The Kaduna State government had consequently charged El-Zakzaky and three other leaders of the Shiite group to court in April 2018. They include Mallama Zeenah Ibraheem, Yakub Yahaya Katsina, and Sanusi Abdulkadir Koki. The Shiite leaders were charged with eight counts bordering on culpable homicide, inciting disturbance and promoting unlawful assembly.